SAN FRANCISCO, Calif. (August 27, 2012) – Lucasfilm Ltd. and Twentieth Century Fox have announced the official release dates for the 3D theatrical launch of Star Wars: Episode II Attack of the Clones and Star Wars: Episode III Revenge of the Sith. Attendees at the closing ceremony for Star Wars Celebration VI, the franchise’s massive fan event, learned that the epic movies that chronicle the rise of the Galactic Empire will be released back-to-back, with Episode II hitting theaters on September 20, 2013 and Episode III arriving soon after on October 11, 2013. With its deeply detailed worlds and engulfing action, Star Wars is perfectly suited for the immersive 3D theatrical experience. Episode II and III deliver such captivating locales as the gleaming clone hatcheries of rain-swept Kamino, and the fiery lava planet of Mustafar as well as spectacular action sequences like Yoda’s unforgettable debut as a lightsaber duelist, the explosive space and ground battles of the Clone Wars, and the dramatic showdown between Obi-Wan Kenobi and Anakin Skywalker. Supervised by Industrial Light & Magic, the meticulous 3D conversion was undertaken by Prime Focus, the global visual entertainment services company. With their proprietary View-D™ process, Prime Focus transformed Episode II and III into 3D with the utmost respect for the source material, and with a keen eye for both technological consideration and artistic intentions. One of the world’s largest producers and distributors of motion pictures, Fox Filmed Entertainment produces, acquires and distributes motion pictures throughout the world. These motion pictures are produced or acquired by the following units of FFE: Twentieth Century Fox, Fox 2000 Pictures, Fox Searchlight Pictures, Twentieth Century Fox Animation and Fox International Productions. Twentieth Century Fox International is a unit of Fox Filmed Entertainment, a segment of Fox Entertainment Group. Revenge Of The Sith 3D Release Has Been Moved Up! 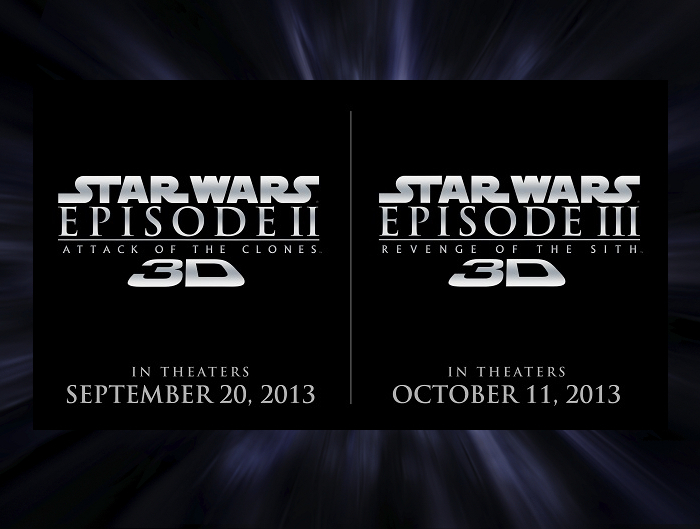 Attack of the Clones & Revenge of the Sith 3D Release Dates Announced!